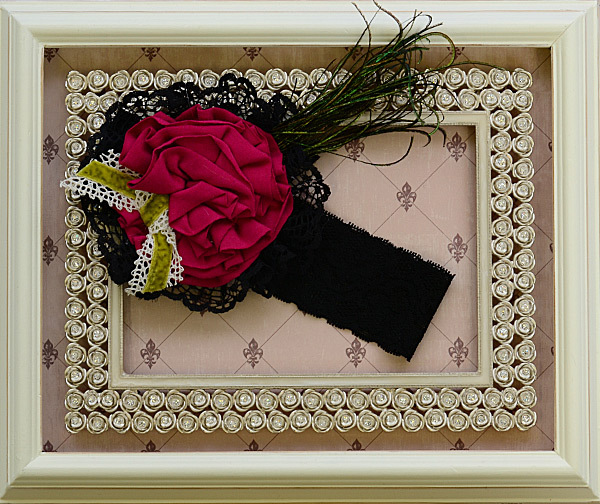 $7.8 - Fashioned with soft lace, this beautiful headband from Persnickety is feminine and fabulous for fall! The band perfectly stretches around her head with a band of smooth, stretchy black floral lace that looks absolutely gorgeous when paired with her favorite hairstyles! Atop a setting of gorgeous black eyelet lace sits a bold, hot pink rosette accented by ivory lace, lime velvet ribbon, and dark emerald wispy feathers to give the piece an edgier look. Wear with some of her favorite fall outfits for a look that is perfect for any occasion!